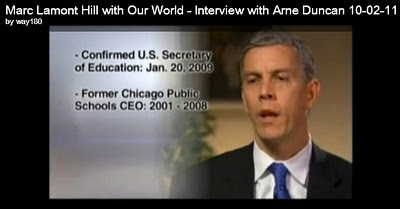 In June I reported about an inquiry from Michael P. Goldenberg of Ann Arbor, MI, to Secretary of Education Arne Duncan. Goldenberg had questions about a $174,000 contract Duncan arranged when he ran the Chicago Public Schools (CPS). Save-A-Life officials say they have taught the Heimlich maneuver and other first aid techniques to more than 1 million schoolchildren since 1995. They claim to have taught nearly 70,000 children how to save a life in the Chicago Public Schools this year alone. On the Save-A-Life website, the organization promotes itself with a cartoon character of Schools' CEO Arne Duncan, who acts as an animated pitchman. ...Schools CEO Arne Duncan says it seems unlikely that (the) organization could have taught the number of students they claim. With a developing mess that may involve President Obama - the Huffington Post reported that he was "close" to SALF, an allegation for which a White House press officer has promised me a response - you might think Duncan would provide a prompt and unequivocal denial. But four months after Goldenberg's letter, the Ed Sec hasn't made a peep. Instead, evasive, play-dumb e-mails from a Department of Education Communications Director seem to bolster concerns raised two years ago by the late education critic Jerry Bracey in his final column, The Skeleton in Arne Duncan's Closet. Halloween season is an appropriate time to talk about rattling skeletons in the closet. US Secretary of Education Arne Duncan appears to have a noisy one dating from his years running the Chicago Public Schools. Her name is Carol J. Spizzirri. A little background. Spizzirri is a convicted shoplifter. According to a sworn affidavit by her ex-husband, a court ordered psychological evaluation diagnosed her as a paranoid schizophrenic and pathological liar. Spizzirri claimed to be a registered nurse and a renal specialist. Her alma mater, now defunct, denied giving her an RN and reportedly she has never been a registered nurse in either Wisconsin or Illinois, as she had claimed. One of her daughters filed a protective order against her because of alleged abuse. Arne Duncan, then the chief executive officer of the Chicago Public Schools, now United States Secretary of Education, had lauded what the foundation was doing for the schools and effused, "Carol [Spizzirri] is one of my heroes." Shortly before her death, the girl filed a protective order against her mother who she claimed had struck her "on several occasions and threatened her on many occasions." (SALF founder/president Carol) Spizzirri launched a nonprofit organization dedicated to teaching children emergency response techniques, raising at least $8.6 million in federal and state grants for her Save-A-Life Foundation...(Spizzirri) estimates 2 million children took the classes, many of them from the Chicago Public Schools. However, in response to a federal court subpoena and public records requests, CPS can't produce any training records. SALF's now under investigation by the Illinois Attorney General and by the US Centers for Disease Control and Prevention. The CDC awarded SALF about $3.33 million, money that SALF told the CDC was used to train public school students in Chicago and Milwaukee. But the Milwaukee Schools don't have any records either. According to a letter from the office of the Inspector General of the Department of Health and Human Services, the CDC is supposed to be looking into the role of Douglas R. Browne, a CDC Deputy Director who moonlighted as SALF's Corporate Treasurer according to an article in The Hill. Duncan arranged a two-year contract with Spizzirri in which her organization was supposed to provide first aid training for 18,000 students during school years 2004/05 and 2005/06. Duncan signed off on $49,000 from the CPS coffers and Ronald McDonald House Charities kicked in another $125,000, a total of $174,000 handed to SALF. The Chicago Public Schools does not have any responsive documents to your April 29, 2011 request. The schools who received training from the Save A Life Foundation were selected by members of the former CPS Chief Education Officer’s Office. Which brings us back to Michael Goldenberg's inquiry. Goldenberg, who's spent his career in public education, posted his letter to Arne on his blog and included a link to my web page, Did Arne Duncan unknowingly help a bogus nonprofit rip off $174,000 from the Chicago Schools & McDonald's Charities? Goldenberg wanted to know if the former Chief Education Officer of the Chicago Schools thought the current Inspector General of the Chicago Schools should investigate the $174,000 contract Duncan arranged for SALF. In a follow-up, Goldenberg asked if Duncan had a financial relationship with SALF. Answering those questions should be easy dunks for a White House cabinet member and a former basketball pro. We received your letter to Secretary Duncan regarding the SALF program in Chicago Public Schools. Since the Secretary is no longer affiliated with the school system in Chicago, your best source of information is the school system itself. They would have all the records and data. (On my blog) I intend to report that Mr. Duncan and you would not answer any of Mr. Goldenberg's questions including whether or not Mr. Duncan had a financial relationship with SALF. If you wish to dispute that characterization and/or provide further information or clarification, please get back to me no later than Wednesday, October 5. Mr. Heimlich, I was (sic) responding to your emails and voice mail to let you know that I don't have any information about this issue. But I don't fault Ms. Dorfman. She's just stuck with the crummy task of having to cover for a boss who apparently doesn't want anyone going into his basement where - if you listen - you might hear a $174,000 skeleton moaning and rattling its chains.